We are a general builder’s merchant with extensive stocks of heavyside materials, timber including sheet materials, plumbing and heating, sanitaryware, tools, ironmongery and decorating products. 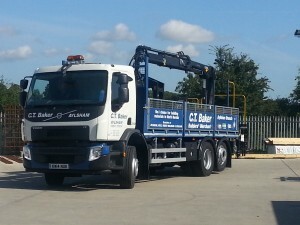 The company currently has 1 – 26t GVW Volvo & 4 – 18t GVW Volvo vehicles each fitted with with Hiab cranes, 2 – 7 T Iveco Daily vehicles with Maxilift cranes and 4 pick up trucks. Whatever your transport requirements we can deliver promptly including where access is difficult. All branches have their own crane off load vehicle and a small pickup truck which enables us to deliver bulky items on the larger vehicle with the smaller vehicles used for lightside materials and less accessible delivery points. All branches have friendly experienced staff and you can be assured of a very warm welcome.